Significantly reduces the appearance of age spots, discolorations and dark blemishes. Unique formula helps smooth darkened areas, while balancing and brightening skin tone with the most effective professional-grade ingredients including retinol, kojic acid, vitamin C and glycolic acid. 2 oz. The Pigmentation Repair is a professional-grade formula containing three of the most effective skin-brightening ingredients: Retinol 1%, Kojic Acid, and Vitamin C. The use of Glycolic Acid in this formulation is unique and helps smooth darkened areas. 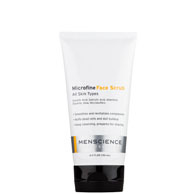 Use the Microfine Face Scrub at least twice a week to help even skin tone. Use the Pigmentation Repair Formula twice a day on affected areas only to reduce the appearance of uneven skin tones and discolorations. Follow with the Anti-Aging Formula to help fight the signs of aging. Complete the morning routine with the TiO2 Sunblock SPF 30 to protect the skin from the damaging effects of the sun and to prevent the re-darkening of affected areas due to sun exposure. How long does it take to see the effects? Will the Pigmentation Repair Formula cause white spots to appear on my face? Why does Pigmentation Repair separate and turn brown after a number months? Is it still safe to use? What is the percentage of Kojic and Glycolic Acid in your Pigmentation Repair Formula? Does the product cause any irritation? Can the product be used on other areas, such as the hands? Uneven pigmentation and so-called “age spots” (lentigines) are the result of skin’s aging and sun damage. This is a common situation with men’s skin, and causes it to look devitalized and damaged. Each man’s skin and age spots are different, so results will vary, but in general, most men should see their appearance improve after 2-4 weeks of regular use. It may require up to 6 months for maximum effects. To prevent intensification and reappearance of age spots, continued protection from the sun is required. No, Pigmentation Repair Formula improves the overall appearance of the skin and should help even the skin tone. It is normal for the Pigmentation Repair Formula to look that way over time. This is a partially due to the effects that oxygen and light have on the key ingredients (Retinol). You can still use it and it will retain effectiveness at least 6 months after opening. Please note that all skincare products' effectiveness tends to decrease with time after opening. Our Pigmentation Repair Formula contains less than 1% each of Glycolic and Kojic Acids. Yes. The Pigmentation Repair Formula can also be used on the hand area. Keep away from eyes, mouth and mucus membranes. “Make long-term investments when it comes to your skin. 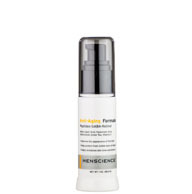 This pigmentation repair formula is guaranteed to improve the appearance of those age revealing lentigines." 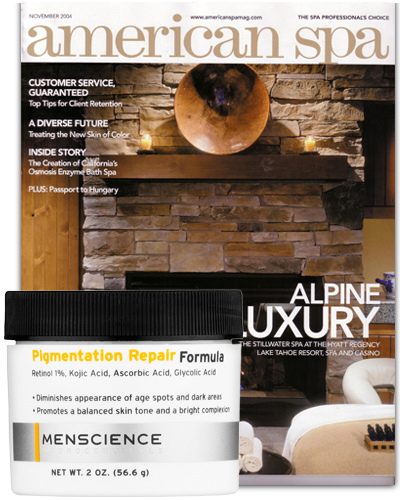 “Men can attain a healthy-looking, youthful complexion with this Retinol cream." “Add this product to your daily regimen and help your skin regain its youth by diminishing the appearance of dark spots cause by aging and sun damage." I used the Pigmentation Repair Formula to even the skin tone in my face. After a couple of weeks of consistent use I noticed a difference in the affected areas. A word to the wise though, make sure to use a sunscreen like the TIO2 Sunblock SPF 30. I didn’t and after some time the dark spots returned. My husband asked me to find him something for the dark spots and to help with his sun damaged skin. I picked this because of the ingredients that are in it. Like the Glycolic acid/ AHA, Retinol, and vitamin C, which I had read helped with dark spots. He's been using it for about 6 weeks now and he said that it is actually working, so he wants me to order him some more of it soon. As I have aged, my skin developed some areas that were discolored as happens with many men. I have used this product daily now for several months and I have a much smoother, and younger, looking complexion. I am very happy with the results. This product is excellent does wonders on my skin I had terrible discolored pigmentation I recommend this product my skin is toned all my dark spots are gone. i have always had old acne scars on my skin , its kind of like having a lighter complexion but with black to dark brown spots in it which always made my confidence level go down because I felt awkward and wanted to have perfect skin but like most of you guys I didn't want to wear makeup and try feminine products to cure it , but then I came across menscience pigmentation repair cream and noticed a huge difference in my complexion and the dark brown spots on my skin dramatically faded till I could not notice them I felt a huge boost in self confidence and I had great results within a week in the spot fading , so I have to urge you guys to buy it and add it to your collection of awesome skin care products . I originally bought to help alleviate years ago mild sun damage and some dark areas on the top of my balding head. I gave it a good amount of time going through the whole jar. Only positive result was it did even out my complexion a little, but did nothing to reduce the sun spots and dark areas. My fiance made a comment a few months ago that the only thing that gives my age away (48) are the age spots on my hands (years of sun bathing). 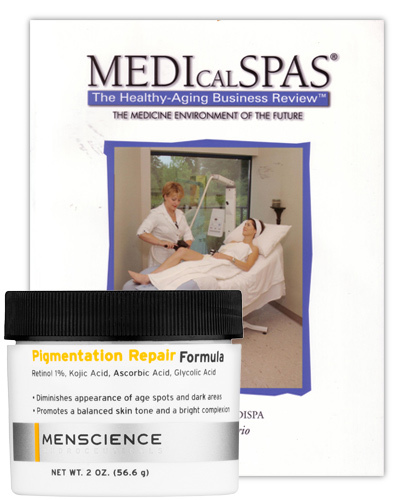 After much research, I decided to try MENSCIENCE Pigmentation Repair. We took pictures of my hands the day I received it so I could track the progress. After only using it three weeks the difference is amazing. The spots are not completely gone, but far lighter than they were and as I continue to use it I look forward to seeing the change in my hands....look younger already. Ladies, this is not just for men, it's a great product and well worth the price. I see myself using this for the rest of my life. Thanks MENSCIENCE!!! I've been using is for rougly 2 weeks. Will update my reviews after a few month. I have only used product briefly, I have not noticed any real changes, but it does make my skin feel tighter, I work a lot in the sun so I have used it maybe 20 times so far, and I concentrate were I have some old acne scars and lightly apply to rest of face hoping it gets rid of them or at least fades them a little, only time will tell, can't really give it 5 stars maybe if I get a chance to write another review later after I have used it for a while. I have been using this on my face and arms and it has gotten rid of all my age spots! It took me about a month to start seeing a big difference. I can finally live with my face an even color! 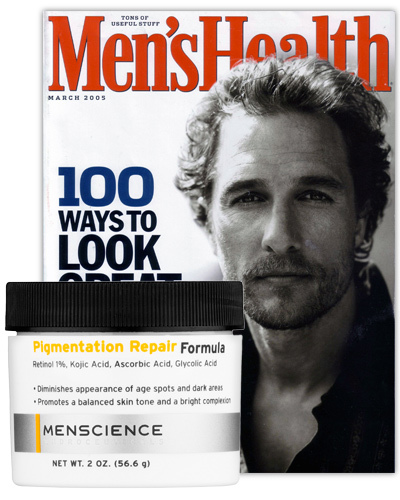 While searching the internet for a skin product to help clear the temple areas of my face of patchy brown spots, an ad from MenScience popped up. I clicked on it and read the reviews. I saw some positive and some negative reviews about the Pigmentation Repair Formula. The price was reasonable so I ordered a jar, along with a tube of Microfine Face Scrub. I made a good decision. I have been using these products for about two weeks now and, yes, I am extremely happy with the positive results I am seeing. I intend to continue using these products and trying other MenScience products. My face was damaged from acne scars and uneven coloring. I have been continuously using this product for a month. I't is by far the best thing I have done for my face. Highly Recommend!!! I've had a few brown stops on my face that appeared a little over a year ago. The dermatologist said its sun damage and recommended a costly treatment. I decided to try an over the counter cream. It worked some but not the result I was hoping for. 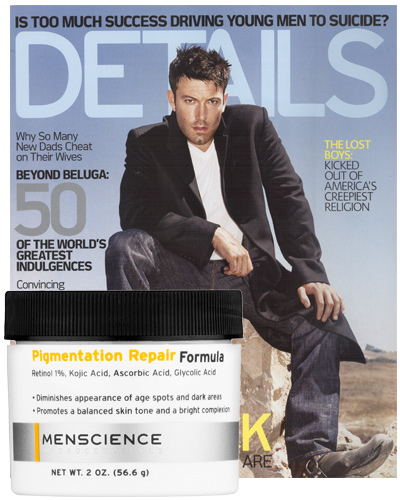 I decided to try Men's Science pigmentation repair and after just a few weeks, they are almost gone. I'm very happy with the results and would reccomended this highly !!! I have suffered from razor bump scars that I could not get rid of. I had so many that my entire neck was a few shades darker than my face. I tried other products for years with little to no results. Since I've tried the Pigmentation Repair Formula my skin is becoming lighter again. I've only been using it for 3 weeks but I saw a difference within the first week. Hopefully, going forward I will see more improvement. I hate to say it, because I like a lot of Mens Science products, but this didn't do anything for my spots. Maybe, just maybe, I noticed a very little bit of evening tone to my skin but the spots remained. I followed the whole system as recommended, using their products, washing my face, exfoiliating, face lotion, etc. Maybe it's based on your skin type but it didn't work on me at all. Age spots? What age spots! I'm 56 and a few years ago started getting dark spots on my face. I use the Pigment Repair Formula every day after my shower whether at home or the gym, and the spots have completely disappeared. I use it sparingly all over my face and neck as a "pre-moisturizer" and it gives my skin a translucent glow that translates to "more youthful". I've even started seeing other guys at the gym using it as well. Highly recommended. Results take a little time but are clearly visible. 30 days, looks as if working but too soon to tell. Now this is what I'm talking about. Works just like it says. Gets the job done! I recommend highly recommend it if you care about your looks. Before I purchased the products, other reviews indicated results within two weeks, so far I have not seen any changes. Let's just say this stuff REALLY WORKS! I bought it for my dad as a Father's Day gift and because he has had these dark brown discoloration patches on his cheekbones for years now. My mom, sis and I were too afraid to let him use any skin products because we were afraid that it might make it worse; however, this time around and after reading all the positive reviews on here, I decided to give it a try. I was really skeptical at first but after seeing him used it for a few times, the results were clear. The brown patches on his cheekbones are fading rather rapidly right now and it seems as though they weren't there in the first place. Only if the website would have a picture attachment option, I would post them up for people that are reading these reviews. He only used them once a day because the product itself doesn't contain SPF and so, he only used it at night after showering. Fantastic Products Equal Fantastic Results! I recently purchased the Pigmentation Repair Formula and I am extremely welll pleased with the results of the product. I had several "red rash areas" on both sides of my face and they have almost completely disappeared and the two "liver spots" on my facial area are diminishing daily. This product does everything that it claims to do and I recommend it highly. I also want to mention that I use the Anti-Aging Formula Lotion, Eye Rescue Formula, Eye Mask and the Facial Tone Enhancer and have received many compliments on my new appearance from a lot of my friends who are not aware that I am using these products. Thank you MENSCIENCE for producing such great skin care products for men; keep up the good work! I think Pigmentation Repair Formula. is what I have been looking for. I am mad. I didn't know this product soon enough. only eight days now. my face is just how I dreamt it to be. Can't say at this point.. It has been 2 weeks and I see no difference. I will continue to use it. After applying twice a day for almost one month, the results are dissapointing. For the kind of job I do, I am not the kind of guy who may spend much money trying to clear my face. but is a self conciouse or confidence thing. I didn't like it when I lood at the mirror or take pictures and see the roughness in my face, somehow, I feel that's how people may veiw me as well. So I have tryied so many facial creams in the open markets, some made my face even darker. I am black. I turned to the internet. I ordered some creams. they were more expensive yet dissapointing. I thourght specifically, I should order the ones made for guys. and the initial place I turned was worst considering how much I paid. finally (I hope finally) I just typed on my computer to search for facial cream for men. When mensiensce purped up. I didn't hesitate like I always do. for trial. Hopefully like I said, this is the end of my search. I think Pigmentation Repair Formula. is what I have been looking for. I am mad. I didn't know this product soon enough. only eight days now. my face is just how I dreamt it to be. I mean. My face is clean. ( now this ladies should know about this. kidding). For years I had brown spots from sun damage and nothing worked, I happened to see an add for MenScience Pigmentation Repair and decided to try it. It worked within days the spts began to lighten and disappear. Use it ebry morning and evening after getting washe, it takes no time. It was the only product that worked and I have spent a fortune on skin pigmentation products. I've been using this product for almost a month now and I've noticed some evening of my facial skin tone, where many age spots had formed near the upper outside corner of my cheeks. I probably did not use a lot of sun screen when I was younger, so the result has been sun spots on the cheek area of my face. Of course I always wear sun block when I spend many hours in the sun when golfing or snowboarding or at the beach or baseball game. But the sun spots/age spots are inevitable and this product has shown some slight improvements in about 20-30 days. I've used it almost every day both day and night but mostly while sleeping so I've gotten maximum use out of it. I've taken "before" pictures with my camera and will take "after" pictures after I've seen the improvements level off. But for those of you wondering whether or not the stuff works, it doesn't make extreme improvements but does enough to make a nice noticeable improvement! I use this product as least 4 times a week and have seen real changes. I used a different product before this one and I saw no changes to my spots around the eye but I do with this product. Living in Southern CA you need this on a daily basis. My wife and I love it! Finally, something that really works. I look young for my age, but the spots on the back of my hands gave it away. I've been using the product for over two years now, rubbing in dab of Pigmentation Repair twice a day. I can see the difference. The spots are fading and the texture of my skin is improving, as well. The nice thing is that my hands don't look bleached out where I've applied the product compared to the rest of my skin. The cream smells good and feels good, too. If I wasn't satisfied, I wouldn't keep buying this product. A gel would be better. It's too oily for my skin, I can only use it a few times a week. Apply a small amount to affected areas only twice a day or as directed by a doctor. Regularly use TiO2 Sunblock SPF 30 to prevent re-darkening areas due to exposure to the sun. Further improve skin tone and coloration by regularly exfoliating skin. Gentle exfoliation with the Microfine Face Scrub will help shed the darkened, superficial cells and expose new undamaged cells. High-performance ingredient used to improve the appearance of darkened skin areas. Helps reduce the appearance of darkened areas, such as lentigines or areas under the eyes. Powerful and natural antioxidant which helps smooth and brighten the skin's appearance. Used by dermatologists and skin care professionals to promote smoother, softer skin, and a reduction in the appearance of fine lines, dry patches and dark spots. A flower well-renowned for its powerful skin conditioning features. Refreshes and revives delicate skin. Derived from Vitamin A, Retinol is an antioxidant vitamin that is part of the chemical family of retinoids. Retinol is widely used by skincare experts to smooth and soften the appearance of the skin and to help even skin tone. Extracted from the nut of the African Shea tree. Is an effective, time-honored emollient that moisturizes and rejuvenates the appearance of skin, as well as restores suppleness. Ingredients: aqua purificata, c12-15 alkyl benzoate, butylene glycol, hydrogenated polyisobutene, sodium ascorbyl phosphate, cetyl alcohol, ceteareth-20, glyceryl stearate, peg 100-stearate, dimethicone, caprylic/capric triglyceride, sodium hyaluronate, magnesium ascorbyl phosphate, hamamelis virginiana , polyacry- lamide, c 13-14 isoparaffin, sodium ascorbate, laureth-7, chamomilla recutita, vitis vinifera, malva sylvestris, tetrahexyldecyl ascorbate, glycolic acid, tocopherol, kojic acid, pinus pinaster, glycyrrhiza glabra, retinol, lactic acid, phenoxyethanol, ascorbic acid, ethylhexylglycerin.